Have you been avoiding the dentist due to fear or anxiety? Or has it been so long that you’re embarrassed or ashamed? At our practice, we promise to never “guilt-trip” or scold you about your teeth. Instead, we simply focus on positive change to our patients’ health, and you’ll find that our caring approach is very accommodating to those with dental fears or anxiety. 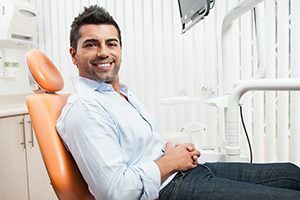 Take a look at some of our tips on how to deal with a dental phobia, and then it’s up to you to take that important first step by making an appointment! Bring a friend or relative to your appointment. A trusted companion will help you feel more secure, and having someone to talk with can help keep your mind off your appointment. Make your appointment early in the day. That way, you won’t spend the whole day worrying about your visit. Don’t tell people about your appointment beforehand. They may bring up their own dental fears or negative past experiences. Fear is contagious! Tell us about any fears, concerns or special requests! We have some very effective treatment techniques and are here to help you!